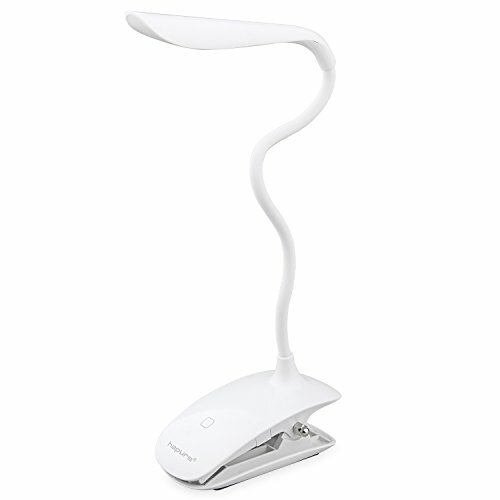 Multi-purpose Clamp - LED Clip on Light, Adjustable sturdy handy clip acts as a stable base with gooseneck arm, allowing the led lamp to stand on its own, clips to headboards, desks and tables to provide a stable light source wherever you need. 3-LEVEL Adjustable Brightness book light . With touch-sensitive control panel, ultra-bright LED light provides a clear, bright spotlight for reading in the dark, camping, or emergency.Good choose for book light. Elegance design - This led book light with flexible gooseneck tube to adjust its height and angle, 14 long life LEDs, ultra portable and lightweight (4.6 oz). Easy to use - Touch-sensitive switch offers 3 brightness levels, recharges via USB to laptop/computer or outlet via recharges via adapter.Book light for reading in bed. USB Charge-- This battery operated lamp recharges via USB connection, you can use the mobile power charger. Single touch brightness up to 8 hours. If you have any questions about this product by Hapurs, contact us by completing and submitting the form below. If you are looking for a specif part number, please include it with your message.